I started playing Defiance and of course I am using my Logitech G13. 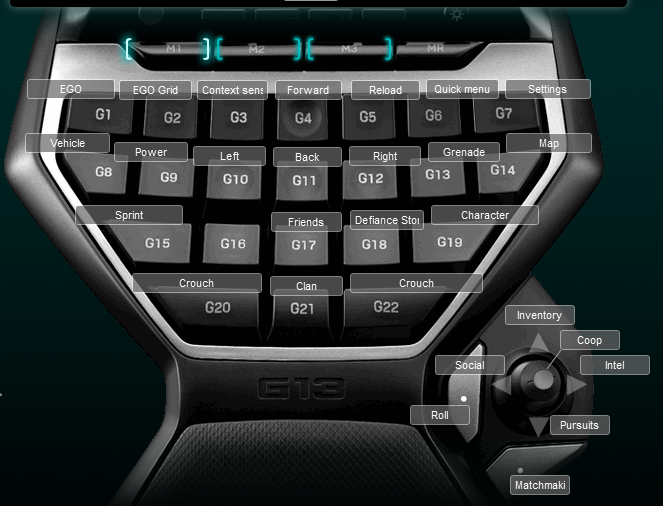 Since there wasn’t an existing profile I just made my own Defiance Logitech G13 Profile. The profile is my standard FPS layout. I put the social menu on the joystick to make it easy to access those menus. I think the Esc key is probably the only button I am really missing. The configuration has worked well so far for all of the different power sets. I put melee and jump on my mouse side keys, typical FPS for me, and they have worked well both for PVE and PVP. Below is a screenshot of the keyboard layout.